It’s common knowledge that the late actor Paul Newman once asked Bates to recast its Newman Day tradition. The evidence is this 1987 letter from the actor to then-President T. Hedley Reynolds. What’s not been known until now is how Newman probably learned about the Bates tradition. That part of the story involves the person copied on the letter, Laurette Cousineau (now Carle), Class of ’86. 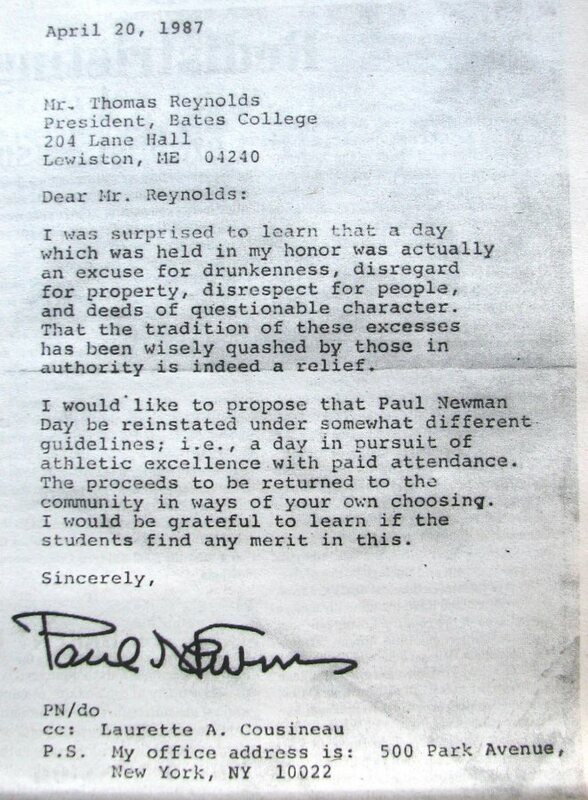 Above is the 1987 letter from actor Paul Newman to then-President T. Hedley Reynolds, as reprinted in a 2001 issue of The Bates Student. Today, Newman Day passes quietly. In the 1980s, however, the event prompted lively debate in The Bates Student between those who defended it for reasons of personal freedom (to get hammered, apparently) and those who decried its effects on the community.